"Friendly service, fair prices and they will work to help you out. I'd certainly recommend them." "I couldn't ask for any more from a garage and would never take my car anywhere else. I rely on my car and you can trust these guys with your life to do a great job, always competitively priced, always willing to go above and beyond the call to ensure the jobs done well, no frills, just good honest service, always with a smile. Thanks Guys!" "Adie has looked after my car for the last four years and done a fantastic job! He always gives good advice, honest service and is great value for money." 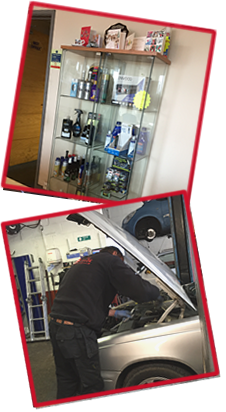 "Really good garage, really good friendly service and always willing to help as much as they can." "Good honest service provided.. will continue to use in the future." "Treated my daughter like a customer, with good service. Thanks :)"
"Excellent, quick and professional service as always today. Have used this garage for some years and have always been impressed. Highly recommended." "Always found them very helpful really looked after my mums car. To John & Team I'm just emailing to thank you for my recent mot and service. Can't believe the difference in the car, it drives so much better and it got cleaned. Thank you all for a job WELL DONE." "Many thanks to you all for your hard work in keeping our vehicles running the way they should and for all your expert advice since we have been with you. Lorraine and I value good customers service and high standards of work in the service centre we select and you guys excel in every department, so have a good Christmas and well earned break and we will see you in the new year. Lorraine and I would also like to buy you all a drink as a thank you and as we are unsure of what you prefer, we have just enclosed the money."